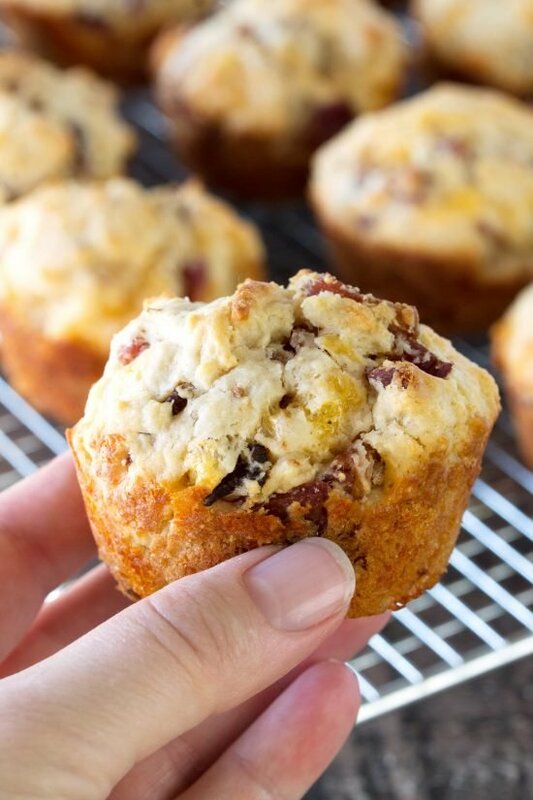 Savory Bacon Cheddar Muffins are the perfect on-the-go breakfast item. It’s a hearty, moist, and deliciously savory muffin that you’ll be happy to wake up to every day! I may have a massive sweet tooth, but I am all about the savory breakfast. There is just something about starting your day with something hearty. 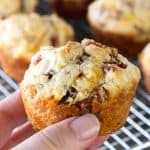 These muffins are packed full of bacon and bacon drippings with yummy melted cheddar throughout. 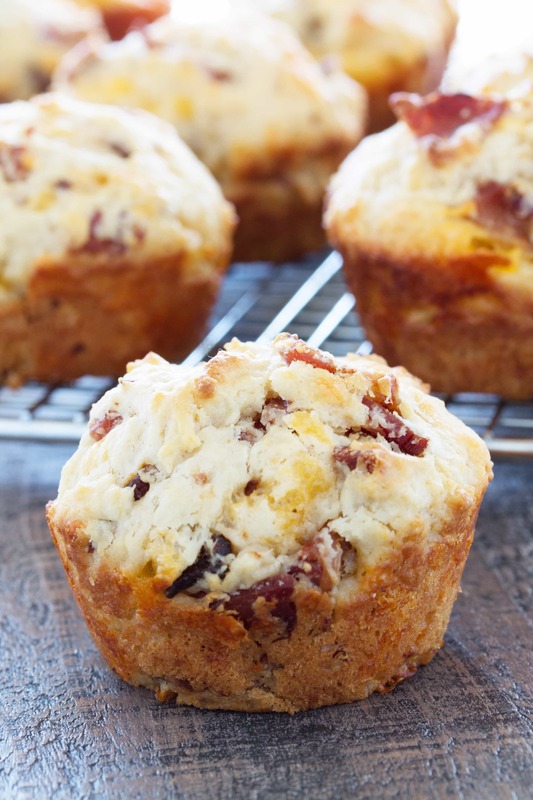 Everything really is better with bacon and this muffin is no exception. Good news! These muffins are also freezable! Simply freeze and store in a resealable plastic bag. When you want your tasty breakfast, just pop in the microwave for about 20 seconds to thaw. You can also use the base recipe for this muffin to experiment with your own savory flavors. Try sausage and rosemary or maybe ham and pineapple. The combinations are really endless! Watch the video where you can get even more great tips and tricks for making this recipe. It’s always nice to have a visual. You can also check out my YouTube Channel where I have almost 200 video recipes for you to enjoy. Lay bacon out on a baking sheet in an even layer. Place the baking sheet into a cold oven. Set the temperature to 400 degrees and set a timer for 20 minutes. After 20 minutes check the bacon and remove when crispy. Transfer to a paper towel lined plate to drain. Reserve the drippings and measure out 1/3 cup. Once the bacon is cool, crumble it. In a medium mixing bowl, combine the egg, milk, flour, sugar, baking powder, and bacon drippings. Stir until combined. There will still be some lumps. Stir in the bacon and cheese until evenly distributed. Divide the batter among a lightly greased muffin tin. Bake at 400 degrees for about 15 minutes, until golden brown. Remove from the pan and cool or eat warm. You’ve probably heard a reference or two (or many!) to bacon-mania where bacon can be used in almost anything. I myself am not a bacon-crazed individual, but I do appreciate the deliciousness that is bacon. In the United States, bacon comes from pork belly. Bacon fat makes for a delicious and versatile flavoring. The above recipe incorporates the bacon fat into the product, but that is rarely the case, especially if you are just cooking up strips of bacon to eat plain. Bacon fat can be stored in a small jar in the refrigerator and will last about a month. Add a tablespoon to your roasted potatoes. Throw it in some cornbread. Saute cabbage in it. Cook your egg in it. Add it to a salad dressing. Sneak it into your hamburgers. Add a little to veggies like green beans, corn, or brussel sprouts. There are so many ways to use it so don’t let it go to waste! 2% cows milk is generally what I use. These muffins are delicious! What a great recipe! Thank you so much! I tried this with Swiss and gruyere cheese instead. Next time I’ll cut back on the. Town sugar, but overall tasty. My husband liked the, with gruyere since that’s one of his favorite cheeses. Would it be okay to use liners in the muffin tin? Yes, they should freeze fine.